The need for a smile makeover is generally indicated when you don’t feel confident when you smile. In many cases people are just not aware of the available treatments to enhance the smile, and could be self conscious and shy about their smile for many years. Some of the treatments are very easy, non-invasive, and not expensive, but sometimes more invasive treatments are needed. Everyone’s teeth are unique so there isn’t one particular type of smile that is perfect to everyone. Our teeth are different shapes and sizes and what looks perfect on one person may look strange on another due to the way the smile suits particular facial features. There are, however, some general factors that make a smile perfect in a broader sense. ARE YOU A CANDIDATE FOR SMILE MAKE OVER? If you are not 100% happy with your smile, you are a candidate for smile design and possibly a smile make over. We are able to assist anyone, from minor corrections to comprehensive treatments. During this appointment, various treatment options and their costs are discussed. We will also look at photos of what we can achieve, as well as a mock-ups of the new smile. Orthodontic treatment is a wonderful way to conservatively correct your smile. Once your teeth are moved with orthodontics, the amount of restorative treatment needed is much less. Using orthodontics in combination with veneers or crowns can often extend the lifetime of the restorations, and also allows for more conservative preparation of the teeth. Orthodontic treatment is ideal where all the teeth visible in the smile are healthy and would otherwise not need any treatment, except for cosmetic reasons. 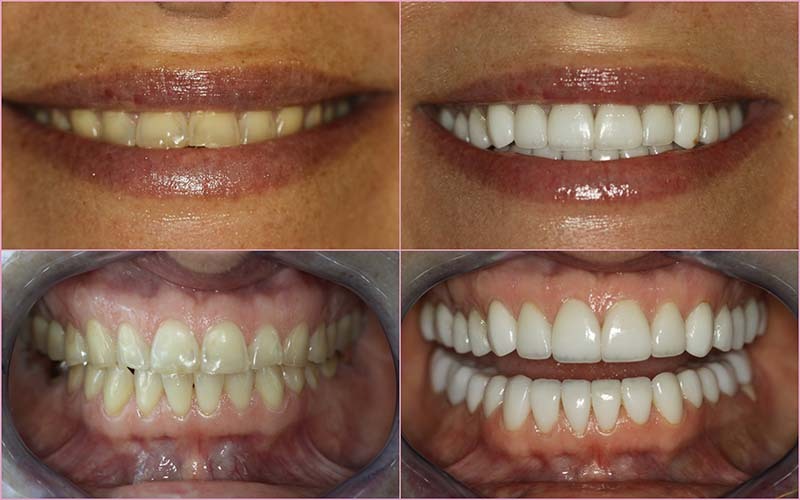 In this instance, we can correct your smile by simply straightening and aligning the teeth. This will give you a lifetime of healthy smiles. Veneers are porcelain coverings cemented onto the natural tooth structure. We use minimally invasive preparation techniques to ensure the conservation of the natural tooth structure. Veneers can be very thin but are extremely durable. The laboratory technician, or ceramic artist, creates the veneers to appear completely natural. There are two main types of material used to fabricate a veneer: composite and dental porcelain. A composite veneer may be directly placed in the mouth or indirectly fabricated by a dental technician in a dental laboratory, and later bonded to the tooth, typically using a resin cement. In contrast, a porcelain veneer may only be indirectly fabricated. Teeth Whitening lightens the teeth and helps to remove stains and discoloration. Whitening in conjunction with a smile makeover ensures that the remaining untreated teeth are as healthy looking as the new veneers or composite bonded teeth. Bonding is the application of a tooth-coloured composite resin (plastic) to repair a decayed, chipped, fractured or discoloured tooth. Unlike veneers, which are manufactured in a laboratory and require a customized mould to achieve a proper fit, bonding can be done in a single visit. The procedure is called bonding because the material bond to the tooth.